Ok, I worked hard to post LOTS of updates of what we have been doing lately. We are excited to officially be on Summer Break for the next 2 weeks! Tomorrow we are heading to Tokyo for a couple of days of sightseeing and eating American food - Krispy Kreme, Outback, Mexican...we'll see what other tastes of home we can find in the Big City! I promise to post lots of pictures next week when we're back! This past weekend was the Youchien (Kindergarten) Summer Festival. It was so much fun and so unbelievable to see all of the amazing-ness of the Youchien teachers. They put so much work into making it an amazing event! The English teachers had a booth of face painting, which was so great, the kids loved it! Unfortunately no pictures of that since we were both working. But here are LOTS of pictures from the fun day! More Summer Yukatas - this is Katherine and her teacher. This is me and one of my 6th grade girls, Madoka. Yes, everyone really does put up the peace sign when you take a picture. The teachers dressed in costumes and did dances to Super-hero theme songs on the stage. This is Chris amused by all of the students dancing to the music. The students practiced in school. The back of the Yukatas - aren't the bows so cute? The Youchien teachers dressed up, again, to go act out a play of The Peach Boy (a famous Japanse story). The other week there was a Summer Festival just down the street from our house. We only went for a little bit, but it was LOTS of fun, and we ran into a lot of our students. There are lots of Japanese festivals coming up and we are looking forward to them! The kids all go to the festivals dressed in their Summer Yukatas. This is Kayla - she is so much fun and looked so cute in her Yukata. On Chris' birthday I started the day off with making homemade doughnuts - they were tasty! Chris got ER Seasons 1 and 2 from the package from America. For dinner I made Mexican food - we had Mexican rice, taco salad and homemade salsa! At night we had a little party at our friends Peter and Rebekah's house - we had the traditional Olson Ice-Cream cake. And afterwards Chris played Settler's of Catan. Chris made my birthday so special this year! We couldn't really celebrate on my birthday because I have class until 8pm on Tuesday nights, so the night before we went out to Koriyama and had some delicious Chinese food and Starbucks for dessert! On my birthday I came home for my afternoon break and there were all kinds of voicemails on our phone. I didn't know, but Chris had sent an email out to a bunch of people from home reminding them it was my birthday and asking them to call me! It was such a fun surprise and so great to hear from so many people back home. It made not being at home, not as hard. We also got some fun packages from home - can you guess which present came from America and which came from Japan? Chris was trying to find me a pie pan for my birthday, and this mini-pie dish was the closest he could find. On my birthday after my night class I went back to the office and was surprised by our entire team - even the little kids (even though it was past their bedtime!) This is everyone hiding. My desk was decorated, too. Bethany heard that we had Sugar Cookies at our wedding instead of cake, so he asked Chris to find the Sugar Cookies recipe and she made them for dessert! The family here took everyone on our team out for the day to celebrate the people who have birthday's in July, which included me and Chris. We had dinner at a delicious restaurant where they had bread for us (they don't do that in Japan), and we ate tasty hamburgers! Before we went to dinner they brought us to a hotel that has an Onsen. An Onsen is a Japanese bath house. The water from the volcano the hotel sits on heats the water of the Onsen and you just sit and relax for as long as you want. Kind of like one big hot tub. Everyone with their tasty bread! The family also bought us birthday presents. Chris got a Japanese calligraphy set so he can practice writing Japanese characters. This Kawaai Sensei showing him how it works. I got a Japanese jewelry box and a Japanese fan, you know like the women who carry the fans with them. Sorry - no picture, but they are both beautiful! Our Easter Program was on July 5th. The whole town was invited and we had about 200 people show up, so the room we were in was packed. It was a great day - the gospel choir sang (you read write, we have a Japanese gospel choir), we did a drama of the Ragman, we sang songs (Redeemer, Nothing But the Blood, & God of Hope), and we shared why Easter is so important for Christians around the world. After the program we had lots of fun with the kids painting Easter eggs, decorating cookies, coloring, and eating snacks. The day was really wonderful and God answered so many of our prayer in the preparation of the program, the amount of the people that showed up and having the exact number of everything we needed! Please continue to pray for the people that came that what they heard would speak to them, and that this would open up opportunities for conversations with the community around us! Chris played the guitar for a couple songs. This is Janelle singing the song Redeemer - she rocked out to the song - it was beautiful! Coloring Easter Eggs - there were 300 eggs, and zero left over! The cookie table...it was crazy, but lots of fun! This is one my second grade students - he's the cutest! These two girls were my biggest customers. Katherine (brown hair) made cookies for everyone in her family. Her sister, Mariana (blonde hair), made a cookie, ate it, and would make another. It wasn't until 5 eaten cookies later, that I realized I needed to stop the madness! This basically sums up their two personalities - we love these girls! I am apologizing AGAIN for the lack of updates. Here's a glimpse at what I've been doing instead of blogging. Promise to update this weekend! I'm sorry for the absence these days. Ever since the Easter program we have been overwhelmed with finishing out the term, as Summer break starts after this week. We aren't officially off school until August 1-16, but the students are done after tomorrow...so we are only 1 day away from some much needed rest and some more time to blog. Please don't give up on our blog yet - I promise to post pictures of the Easter program and some other happenings from the past few weeks! as I remind him of frequently these days! 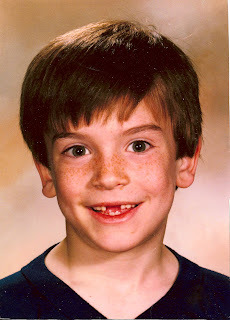 This is my favorite picture of Chris from when he was a kid. Help our friends bring home their new adopted daughter from China! Click on the picture to see how you can order Hairwear for girls and women, priced $4 - $8. Each time you mention "Adoption Fundraiser" a portion of the proceeds will be donated to help bring Mei lynn home.